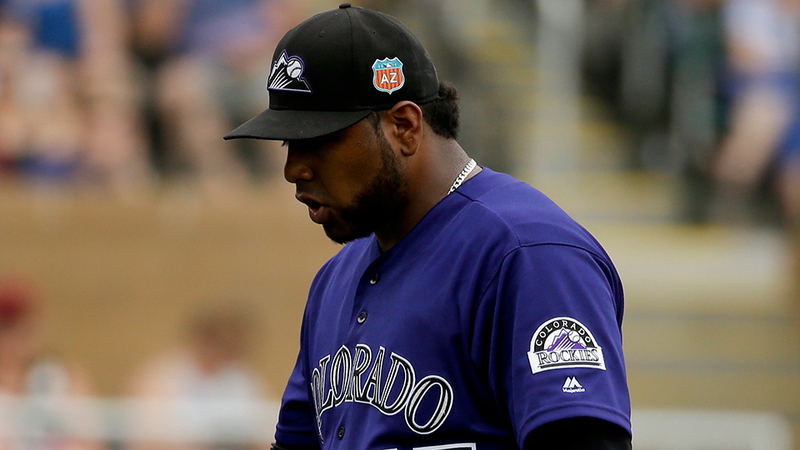 While vying for a spot in the Rockies bullpen, Jairo Diaz hit a snag in the road. Colorado's No. 25 prospect will undergo Tommy John surgery after tearing a ligament in his right elbow. Diaz got off to a great start in his Spring Training debut Wednesday, working around a hit in one inning. Then the 24-year-old allowed three runs on three hits and three walks Saturday, but left after registering just two outs when he felt discomfort near his right elbow. "[Saturday] I got the MRI and they saw something wrong," Diaz told MLB.com. "I didn't feel anything was bothering me, just the last couple hitters." According to MLB.com, Diaz's well-above-average fastball -- that nears 100 mph -- made him a strong contender to be the Rockies closer. After making his Major League debut with the Angels in 2014, Diaz was traded to the Rockies for second baseman Josh Rutledge on Dec. 11 the following offseason. Diaz went 3-5 with a 4.58 ERA and 50 strikeouts in 47 relief appearances with Triple-A Albuquerque before getting the call to Colorado. With the Rockies, the right-hander notched a 2.37 ERA with 18 punchouts in 21 outings.